The Regina Folk Festival will be rolling back into town this summer, and the initial 2016 lineup has just been expanded. Frazey Ford, Twin Peaks, Twin Bandit, marijosée, Eric Taylor, Étienne Fletcher, Gabrielle Papillon, Dirty Catfish Brass Band, Charly Hustle, Factor Chandelier, FadaDance, Kirby Wirchenko, marijo and Hardtoe have all been added to this year's roster. They join a bill that already includes the Head and the Heart, a collaborative set from Ry Cooder, Sharon White and Ricky Skaggs, Sam Roberts Band, the Mavericks, Bettye LaVette, the Cat Empire, and the Strumbellas. Also slated to perform throughout the weekend are Bobby Bazini, the Barr Brothers, Ayrad, Boogat, Terra Lightfoot, Ginkgoa, isKwé, the Wet Secrets, Al Simmons, Matt Epp, the Royal Foundry, Nick Faye & the Deputies, and Megan Nash. 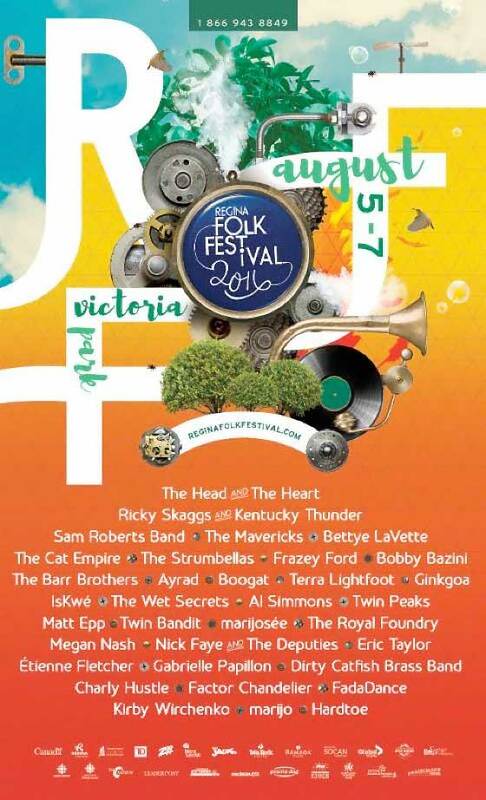 RFF will take place from August 5 to 7 at Victoria Park in Regina. Find full festival information at the official website.